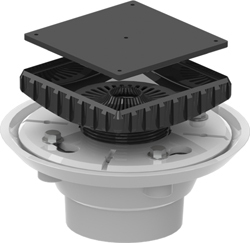 This unit is a complete drain assembly (excluding grate). It includes the drain riser, temporary construction plug, hair trap and 2 piece clamp collar. This PVC version attaches to a standard 3" pipe, and has a 2" threaded opening to accept the drain riser. Drain grates are purchased separately.